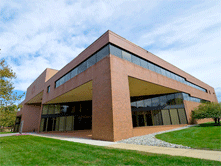 The Princeton AnyWare Center is equal distance between the business hubs of New York and Philadelphia. Learning Tree's AnyWare Centers provide a distraction-free learning environment, dual screen computers and high-speed internet. Free parking is available in the lots surrounding the building. Follow Route 1 North to the Alexander Rd. exit. At the top of the exit ramp, turn right at the traffic light onto Alexander Rd. Follow to the second traffic light, where you will turn right onto Roszel Rd. At the 3rd traffic light, turn right onto Roszel Rd. Route 95 North into NJ. Take US-1 North exit toward New Brunswick. Follow Route 1 North to the Alexander Road exit. At the top of the exit ramp, turn right at the light onto Alexander Road. Follow to second traffic light and turn right onto Roszel Road. Take Roszel Road to the stop sign (post office on left).